The staff at Oxygen Oasis Hyperbaric Wellness Center is comprised of experienced Wound Care & Hyperbaric Physicians, Wound Care & Hyperbaric Technologists, Physician & Community Relations personnel and Office/Front Desk Management and Reception. 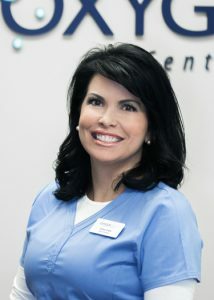 They are compassionate individuals dedicated to providing first class patient care. Oxygen Oasis is committed to obtain continuing medical education in both Wound Care and Hyperbaric Oxygen Therapy, to maintain the quality of care that we know you expect. Working together, we ensure that you receive the safe, quality Wound Care and Hyperbaric service you need and deserve. Jason is an experienced Hyperbaric and Advanced Wound Care Technician with 7 years in the Hyperbaric/Wound Care field and 20 years in Emergency Medical Services. He holds a BA from the University of West Florida and is an Emergency Medical Technician with an Advanced Cardiac Life Support certification. 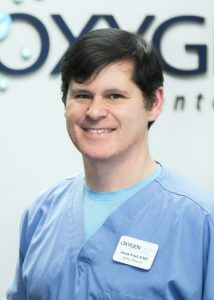 As the Director of Safety and Operations, Jason is responsible for maintaining a safe, healing environment and guiding patients through the process of Hyperbaric Oxygen Therapy treatment and Wound Care from the first appointment through the last. Jason states his favorite part of job are the relationships he builds with his patients and their families over the course of their treatment and celebrating the progress they make week after week. When Jason is not treating patients at Oxygen Oasis, he is practicing Emergency Medicine representing National Event Services (NES). NES provides medical coverage for Philadelphia sporting and concert events which include the Philadelphia Eagles, Flyers, Phillies, Sixers and local colleges. Chanel has 14 + years experience working in the medical field. She is as a Registered Medical Assistant/Phlebotomist and worked in sports medicine for several professional sports organizations in Minnesota. Chanel is also a Certified Surgical Technologist in Labor and Delivery as well as in Dermatology. Chanel’s says her favorite part of being in Hyperbaric Medicine is the journey she takes with her patients; from the beginning of treatment to the very end as she watches them heal. Melissa has 20+ years of experience working in the medical field at Thomas Jefferson University Hospital (Cardiology), Wills Eye Hospital (Retina Surgery) and Doylestown Hospital (Urology). She also worked in the field of Plastic/Cosmetic Surgery for the last 7 years alongside our Medical Director – Dr. Benjamin Lam. Melissa’s goals are to ensure that the Center runs effectively to provide a positive experience for our patients. In her role as Office Manager, Melissa initiates the process of new patient intake and maintains the patient work-flow throughout the Center. Scheduling all patients and providing the appropriate medical history and consent forms prior to treatment. For patients whose conditions are covered by insurance, Melissa is responsible for obtaining medical records to support the patient’s diagnosis and need for hyperbaric oxygen therapy. She will obtain prior authorization if required through the patient’s insurance provider. Melissa processes all insurance claims for HBOT services. Tracking all claims and incoming payments from insurance companies to ensure correct reimbursement. Melissa states that her favorite part of her job is seeing patient’s progress throughout their treatment. “It never ceases to amaze me, the miracles that happen here”. I’m so blessed to be witness to them and part of this amazing team.